Introduction: The fragile coral reefs of the Florida Keys form the largest living coral reef ecosystem in the continental United States (Fig. 1). Lining the shallow outer shelf approximately 5 to 7 km seaward of the keys (Fig. 2), the reefs have national aesthetic and resource value. As recently as the 1970s, the coral reefs were the heart of a vibrant ecosystem. Since then, the health of all ecosystem components has declined markedly due to a variety of environmental stressors (e.g., see papers in Jaap et al., 1998; Porter and Porter, 2002; Lang, 2003). Corals are succumbing to bleaching and diseases (Figs. 3A, 3B, 3C, 3D, 4A, 4B, 4C, 4D, 4E, 4F, 4G, and 4H). Species that are the building blocks of solid reef framework are increasingly being replaced by species that do not construct reef framework. Algal proliferation is increasing competition for space and hard surfaces needed by coral larvae for settlement. Decline of the coral reef ecosystem has significant negative implications for economic vitality of the region, ranging from viability of the tourism industry attracted by the aesthetics to commercial fisheries drawn by the resources. At risk of loss are biologic habitats and reef resources, including interconnected habitats for endangered species in shoreline mangroves, productive nearshore marine and wetland nurseries, and economic offshore fisheries. What are the reasons for this decline? Is it due to natural change, or are human activities (recreational diving, ship groundings, farmland runoff, nutrient influx, airborne contaminants, groundwater pollutants) a contributing factor and if so, to what extent and can they be mitigated? assessing how management and conservation of existing natural resources within that region can effectively be implemented (e.g., Table 1 in the case of the Florida reef tract). 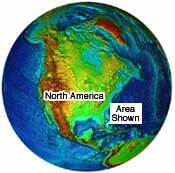 In 1997, the U.S. Geological Survey's (USGS) Coastal and Marine Geology Program undertook a comprehensive 7-year-long mission to consolidate, synthesize, and map new (1997) and existing geologic and biologic information into a digitized regional database and one-volume reference source on the geologic history of the Florida Keys reef tract (this report). The project was conducted in cooperation with the National Oceanic and Atmospheric Administration's (NOAA) National Marine Sanctuary Program. The purpose was to examine the natural evolution and demise of several coral reef ecosystems over the past 325,000 years, with an eye toward gaining a better understanding of the cause of the reef decline observed today. Scientific data and datasets presented in this report are intended for use by others in ongoing efforts to delineate which components of reef decline in the Florida Keys may be natural and which may be a result of human activities. Healthy elkhorn coral (Acropora palmata). For scale, note striped sergeant majors (Abudefduf saxatalis) in center (14-15 cm). Surface-water wavelets are visible above the shallow reef. Same view shows widespread physical damage to coral and absence of fish. Cause of damage is unknown but could be boat groundings or storms. Parts of live coral colony are visible around photo edges and at right center. The shallow reef is reflected on the water surface. Same view shows complete death and destruction of coral and no fish. Photos courtesy of Phillip Dustan, College of Charleston, Charleston, SC. Beyond scientific baseline datasets, this report also incorporates environmental, social, and historical aspects of the Florida Keys, including the impact of exploratory oil wells on benthic habitats off Florida. Beginning in the 1940s and ending in 1962, 14 exploratory oil wells were drilled in the Florida Keys. Five are examined in this report. Three were drilled on the reef tract southwest of the Marquesas Keys in the Gulf of Mexico. About 30 were drilled in deep water off the Gulf Coast of Florida. Two of these are also examined. These studies are also important in light of the recent renewed interest in the 1990s and 2000s in drilling for oil and gas in the Gulf of Mexico. New information on the significance of a nearshore rock ledge that borders the seaward side of every island in the Florida Keys has recently come to light. All evidence on hand points to ongoing island erosion that began about 4,000 years ago. Landmark studies in the Florida Keys (e.g., Ginsburg, 1956; Ball, 1967; Hoffmeister et al., 1967; Hoffmeister and Multer, 1968; Hoffmeister, 1974; Enos and Perkins, 1977; Jaap, 1984; Harrison and Coniglio, 1985) previously examined the geologic/biologic record but from perspectives different than those in this report. Other map series have shown distribution of habitats on the reefs (Marszalek, 1977; Multer, 1993; FMRI 2000), but those maps are less extensive than the benthic map in this report and lack explanation of the geologic and sea-level history. 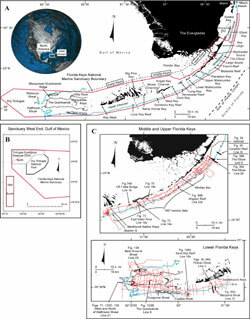 Where appropriate, this report incorporates the significant contributions these and numerous other researchers have made to knowledge of the geologic record of the reef tract, as well as important results of more recent studies on shelf-edge facies (the aspect, appearance, and characteristics of a rock unit; Multer et al., 2002) and effects of African dust on reefs (e.g., Shinn et al., 2000; Griffin et al., 2001; Garrison et al., 2003; Fig. 5; USGS Open-File Report 2001–246; USGS Open-File Report 2003–028). By no means is this report a review of every study done in the Florida Keys. The focus is on an area within the Florida Keys National Marine Sanctuary for which contiguous seismic, aerial-photographic, and sedimentary-grain data are now available (Fig. 6A, 6B, 6C). The area includes the keys seaward ~5 to 7 km to a margin-wide upper-slope terrace (30 to 40 m deep) and extends from a shelf-edge reef known as The Elbow (off central Key Largo) to Halfmoon Shoal (west of The Quicksands in the Gulf of Mexico). The fundamental principle underpinning the study of geologic processes and the geologic record is, "The present is the key to the past." Following this tenet, the report concludes by evaluating the importance of studies on modern reefs as they relate to the rock record. Through laboratory experiments, we examined how modern marine sediments from the Florida Keys become consolidated and compacted into limestone-like 'rock.' The 'rocks' were not limestone only because they lacked natural mineral cements. Compaction produced microscopic features similar to those observed in actual limestone and reduced intra-particle porosity, as occurs naturally in sediments compressed by overburden (overlying layers) through time. Through coring, we investigated how ancient reefs consisting of non-coralline marine-carbonate materials had developed. The reef buildups are now uplifted limestone reefs in mountains of New Mexico. These studies are two of many that apply what we see happening today to what might have happened in the past.